I have a very wide range when it comes to music, as you will have seen if you have followed previous #MusicMonday posts. 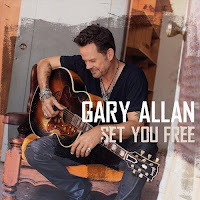 “Every Storm (Runs Out of Rain)” is a song co-written and recorded by one of my favourite county music artists, Gary Allan. It was the first single from his album Set You Free, which released back in September 2012 and happens to be the last three words sung at the end of this song. The song itself is mid-tempo, accompanied mostly by electric guitar and co-writer Hillary Lindsey sings the backing vocals. Let me tell you, it’s borderline inspirational. In it, it expresses the hope of situations improving, saying that “every storm runs out of rain” and that no matter what happens in your life, it will always get better. I find that it is a real ‘pick me up’ when I’m feeling stressed, anxious or down about something as it is a reminder that every hardship, or “storm”, you face will ease up and there will be light at the end of it all. If you were to listen to any song I suggest, this one would be a definite recommendation for everyone - even if you don’t like country music (I’m not a huge fan of country music myself, but Gary Allan is an exception)!